Being the son of a cricket icon and legend, the 18-year old Arjun Tendulkar was in the limelight for being selected in the India U-19 squad for the two Youth Test-series against Sri Lanka. In the rain interrupted day on the second Test at Lord's between India and England, Arjun Tendulkar helped out the grand staff at Lord’s cricket ground. 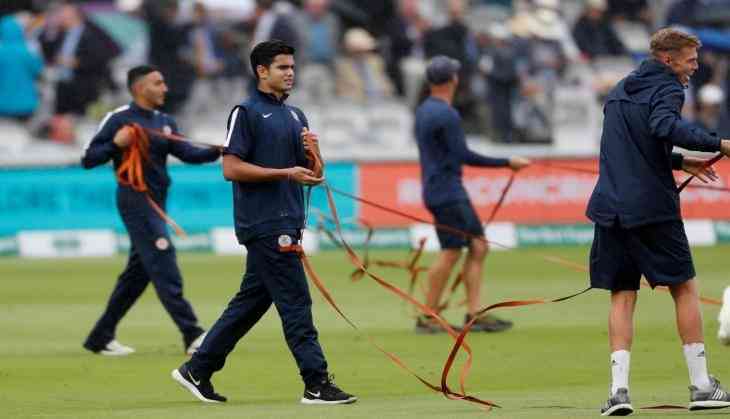 He was appreciated by the management of the cricket ground, who shared a photo of the youngster in a tweet and wrote- "Not only has he been training with @MCCYC4L recently & but he has also been lending a helping hand to our Groundstaff!," Lord's Cricket Ground's Twitter account posted on Friday. The son of Indian legendary batsman Sachin Tendulkar, who is currently in London for a training session with MCC Young Cricketers. The young all-rounder grabbed attention for his humble nature. Also Read: India Vs England, 2nd Test: This England cricketer has made this unique world record that will leave you in shock!